The HOTTEST Wedge In Golf , Order Now! Hold the Green, Lower Your Score! 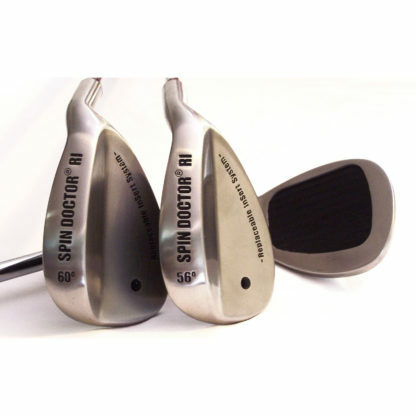 The Spin Doctor RI Wedge is the only wedge in golf with Replaceable Insert System. “Fresh Face Technology”. 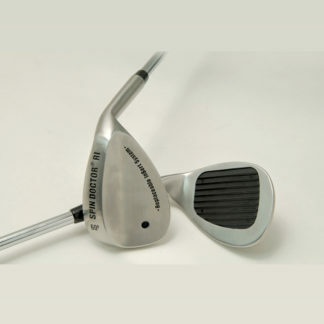 With its classic design, the Spin Doctor RI Wedge ensures superior ball striking and lifetime playability. The Spin Doctor RI Wedge is the only wedge in golf with a replaceable insert system. Put a fresh face on your wedge without replacing your club. Fresh face means better bite. More bite means more spin and control. Your Choice Of Pro-Style Insert: High-impact Diamond, Tungsten carbide, Titanium inserts provide ball stopping control that all golfers will enjoy; Tiny particles embedded on the insert surfaces preserve the precise roughness for consistent performance and spin; U-Grooves that have been manufactured to conform to USGA specifications. 3 Reverse Groove inserts: Give you 250%-400% more backspin instantly; Insert simply reinforces proper ball striking by putting the “fun” back into the short game fundamentals; Not approved for USGA tournament play. Clubs sold separately or in sets. 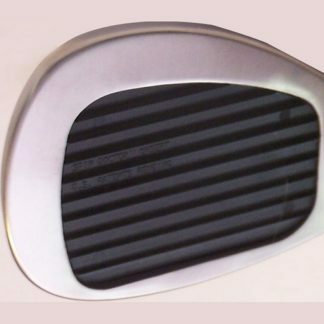 Classic shape profile wedge head. Medium Flex Steel Shaft Or For more distance Graphite Shaft. 52 degree Pitching Wedge, 56 degree Sand Wedge, 60 degree Lob Wedge. You will be amazed at how you spin it back like the pros green after green. This insert simply reinforces proper ball striking by putting the “fun” back into the short game fundamentals. 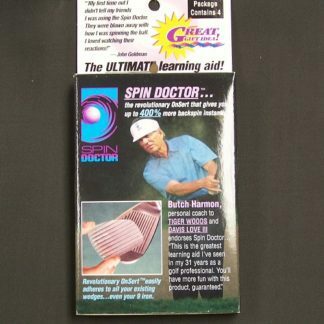 Spin Doctor guarantees you’ll spin it like the pros with this insert; Just get down on the ball and watch it spin back! New Spin Doctor RI Wedge Single club packages include 1 Prostyle Insert, 3 Super Hot Reverse Groove Inserts. 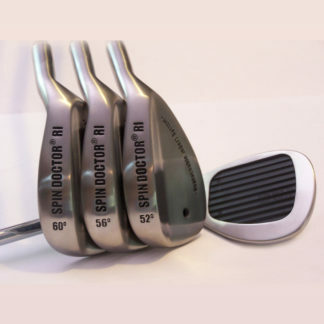 New Spin Doctor RI Wedge 2 club packages include 2 Prostyle Inserts, 3 Super Hot Reverse Groove Inserts. New Spin Doctor RI Wedge 3 club packages include 3 Prostyle Inserts, 3 Super Hot Reverse Groove Inserts. 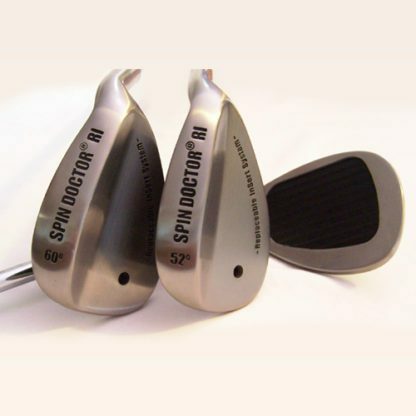 Spin Doctor RI Wedge Demo club packages do not include extra inserts. 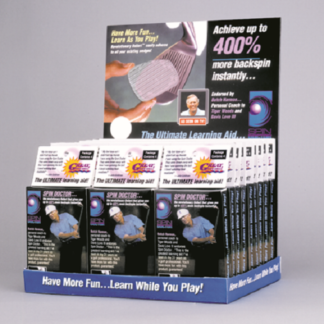 Reverse groove insert gives you 250 – 400% more backspin instantly. The Spin Doctor RI Wedge is the only wedge in golf that lets amateurs change inserts as their game evolves. 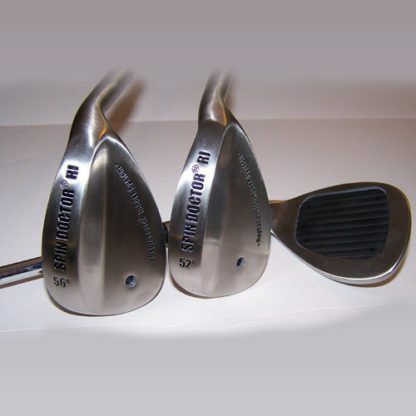 The Diamond, Titanium, Tungsten Carbide, Nickel, and “Self-Rusting” Black Star inserts (grooves are manufactured to USGA specifications) make the Spin Doctor RI Wedge the most versatile wedge in golf.In addition, patented Reverse Groove insert will give you 250 – 400% more backspin instantly. You’ll spin it like the pros! Your friends will be amazed at how you spin it back like the pros green after green. This insert reinforces proper ball striking by putting the “fun” back into the short game fundamentals. 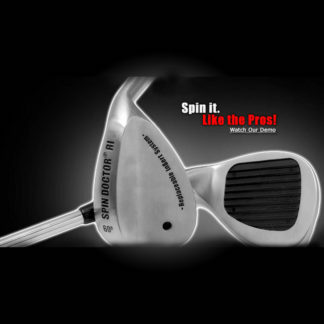 Our patented Reverse Groove insert will give you, 250 - 400% more backspin instantly! Pitching wedges make great chippers from the fringe of the playing area and are very useful on bump-and-run approaches. These clubs are also commonly used for recovery from trouble and punching out of the trees. As the end of an iron set, the pitching wedge acts like a 10-iron. They’re in the normal loft progression of the set and are designed for use on full swings. The average distance a pitching wedge goes is between 90 and 120 yards. A sand wedge or “Gap Wedge” is used to hit a shot with higher and shorter trajectory than a pitching wedge. Gap wedges have a rather wide range. It is often called an “approach wedge” and is sometimes labeled “A.” This wedge is used primarily from the fairway and favors firm lies. Typically 60-90 yards in. Lob Wedge, also called a Loft Wedge or L-Wedge, is a golf club with a high amount of loft, usually 60 degrees. The Lob Wedge can be used from the fairway, the rough, or from bunkers; whenever the player needs to hit the ball high and or stop the ball quickly on the green. It can also be used when the player is on the green and is difficult to putt the ball in. Typically 60 yards in to the pin.